My boyfriend and I are big fans of Thai restaurants. It’s a good thing because Fairbanks, Alaska seems to have more Thai restaurants than any other cuisine. Our orders are always different and he always has the same comment when he tries mine, “Wow, that’s too hot.” I find the differences in our tastes and tolerances for spicy food interesting, but what might be more interesting is it’s effects on my longevity. Recent studies show that mice bred without a specific a specific pain receptor, the TRPV1 receptor, live 14% longer than a normal mouse. The reason may be that the TRPV1 receptors in the pancreas stimulate production of CGRP, an insulin suppressor. With less insulin, animals do not clear sugar from their blood as easily. The mice without TRPV1 had low blood sugar levels and retained their quick metabolisms over their lifetimes and they burned more calories during exercise than their counterparts. So what does this have to do with spicy food? 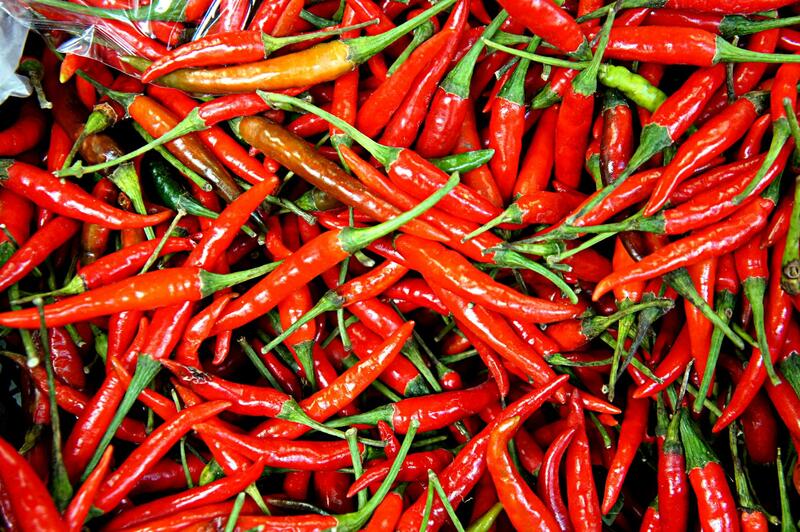 The chemical associated with hot peppers, capsaicin, can kill the neuron that sends signals in TRPV1 receptors. Some evidence even suggests that humans with diets high in capsaicin have lower incidences of diabetes and metabolic problems. So go ahead, order that “Thai Hot” drunken noodle with raw jalapenos, it might just lengthen your life.